Huh How’d that Happen? 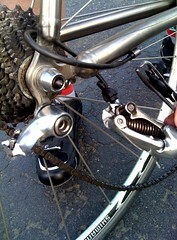 DÃ©railleur broke apart at the elbow. No crashes or big hits. Just failed. I’ve never seen anything like it. This is Pam’s Travel bike, so it could’ve been damaged in transit, but nothing noticeable. The only other epic fail I’ve seen is a chain ring.